A good restaurant relies on more than just its food to bring in and retain customers. A comfortable and pleasant atmosphere is a major factor in any venue and must be taken into consideration during the planning and design stages. When planning to furnish a new restaurant or redesigning an existing one you've got to take into serious consideration the restaurant’s layout and the restaurant’s furniture price, style, design and comfort. Restaurant Furniture Canada allows you to find exactly what you need without having to compromise the seating plan you envisioned regardless of your venue, your decor, or your budget. 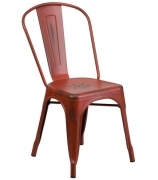 Our wide range of commercial chairs for restaurants includes wood chairs, metal chairs, wood-metal combinations, stackable chair options and more. Some styles are intended for indoor or outdoor use, while others are versatile and can be used in either scenario. Our extensive restaurant chair selection includes styles for anyone refurnishing their space from restaurants, banquet halls and cafeterias to churches, hotels and sidewalk cafes. Many of our styles are customizable — you can get the look you want to go with the décor and color scheme, and to fit the clientele you serve. Plus, most of our restaurant chairs have matching table tops and/or bar stools if you are looking for a complete, uniform "look".